Delicious as a cold seafood cocktail with dipping sauces, Leg Style Crab Supreme can also be chopped and used for salads, in chowders, casseroles and enchiladas. It’s made from a blend of wild caught Pacific Whiting and real Snow Crab Meat and is offered in convenient, resealable packaging. 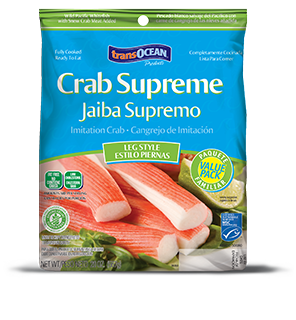 The special, 20 ounce Family Pack is larger than traditional sizes, delivering more value than other surimi seafood products.